Six short years ago, Andy and Rich sat freezing their butts off on a rickety chairlift on the backside of Squaw Valley, California when they finally decided to go for it. After personal investments of $10,000 each and several sleepless nights later, Huckberry is a rising star in the outdoor retail industry — equal parts store, magazine, and inspiration. 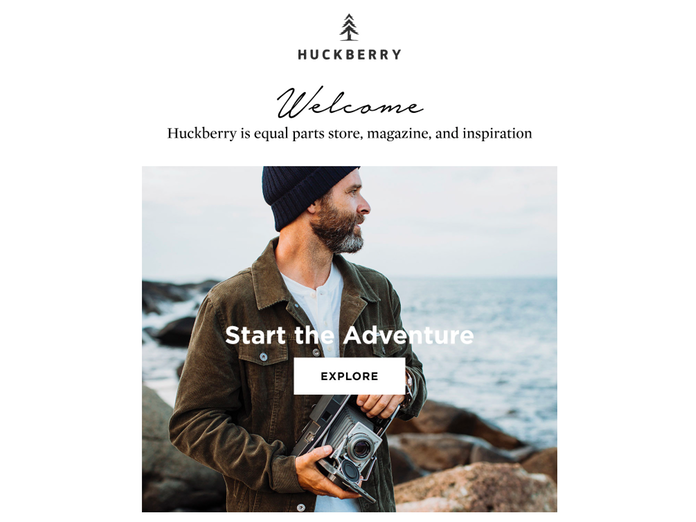 Today, Huckberry has grown to more than 80 employees; sells well over 750,000 products per year; and has gone from $10,000 to $1,000,000 in one year. The article (linked at the end) tells the whole story how they did it. 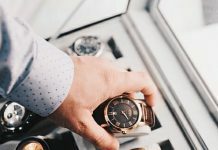 The authors had the rare opportunity to sit down with Micah McKay (the person responsible for Huckberry’s fantastic growth) to learn how they can turn a profit year after year, and in the process, gain loyal customers who stay with them for life. 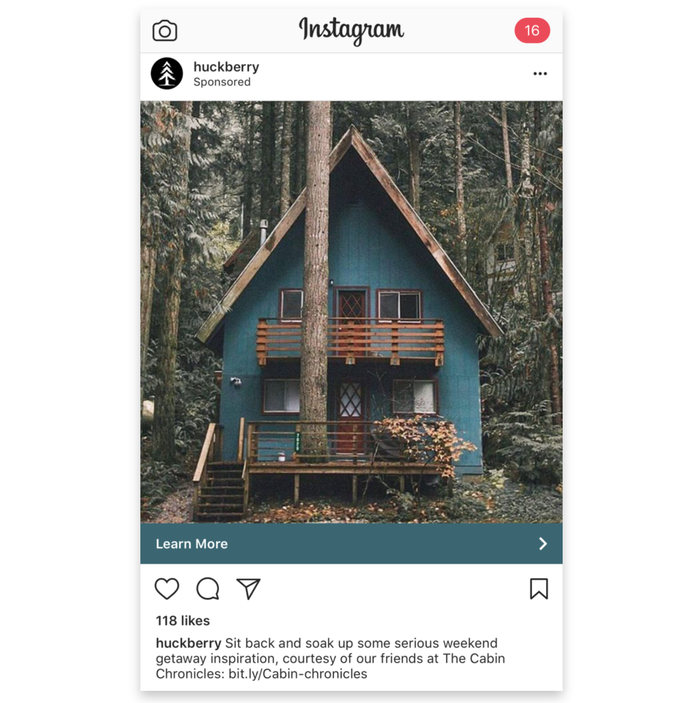 You will see exactly how Huckberry fuels their multimillion-dollar outdoor retail business with a simple, yet undeniably effective approach to marketing. It’s a very detailed case study. I will only show you the main areas discussed, some of the interesting facts, and important findings. I’m familiar with the company for quite some time now, so I will add my own experience with them, where applicable. For all the goodies, check out the article. And be prepared, come with a cup of tea or good coffee (AeroPress is nice!) My Instapaper showed me it’s a 20-minute read. When Huckberry was first founded, of course there were men’s retail stores. There were also a ton of outdoor magazines. But no company seemed to speak to the young, 25-year-old adventure seekers. The ones that lived in the city and spent their weekends in the wilderness. Their storytelling approach to marketing can be found organically across all the channels. Their Instagram account, for example, is a mix of high-quality product photos and outdoor inspiration. Everything from the photo to the caption is a strategic move to tell the Huckberry story. Takeaway: Take time to carefully consider every single little detail of the moment when a customer comes across your company’s website for the first time. Whether someone discovers your business organically on Instagram or through a search engine like Google, your story needs to be so compelling and so unique that it hooks the person in to want to find out more. Use product reviews, testimonials from customers, beautiful imagery or videos, and a simple, mobile-friendly website design to establish trust with potential customers immediately. The story goes hand in hand with great imagery too. On all of their profiles, and on their website. The products are beautifully presented. For a small company like Huckberry that didn’t have a lot of funding or cash on hand when they started out in 2010, marketing channels were extremely limited. The fruitful partnership resulted in two-way affiliate links, dedicated product pages, content, and a lot more – benefiting both parties along the way. Also, it’s nearly impossible to understate just how important big-name ambassadors can be for your brand and/or your product. Huckberry is right up there with one of the best ambassador programs in the world. The list of prominent photographers, travelers, bloggers, and fashion experts goes on and on. There are several ways to structure ambassador programs, but in most cases, ambassadors are either paid a flat commission for mentioning the brand/product in their social media posts or they’re provided free gear in return for a certain amount of mentions per month. We’ve seen ambassador programs work in both cases, but the most common program is the commission structure. 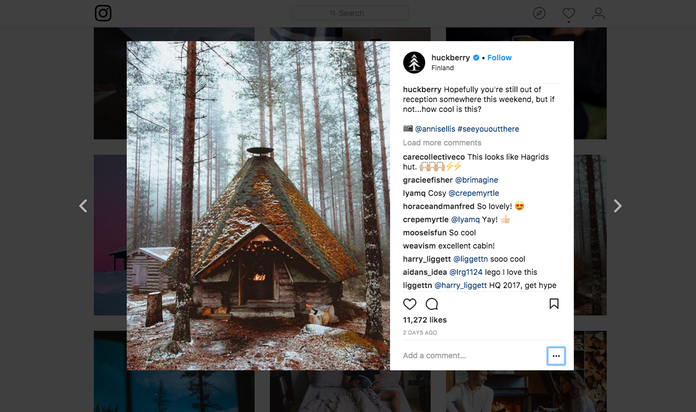 You may be wondering why Huckberry chooses to focus so much energy and attention on creating a unique brand story and publishing content around that story. The answer is: it works. 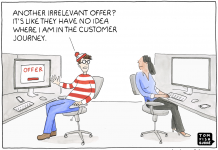 “We consider keywords, search intentions, and create our content accordingly. Everything we create has an SEO element to it. It helps to ensure that our content reaches as far as possible,” says Micah. And above all, their content is fantastic! Just go to the “Read” part of their website and browse for a few minutes. Practically every piece is outstanding. 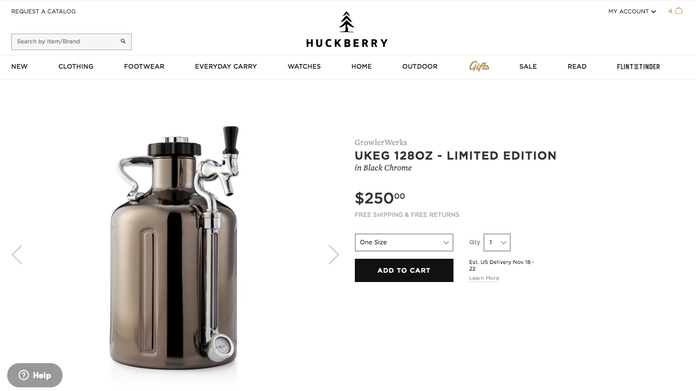 One thing that’s worth noting here is that Huckberry is a members-only website. You can browse their site and read their articles, but if you want to make a purchase then you have to sign up (for free) — making email an important part of communication with their customers. 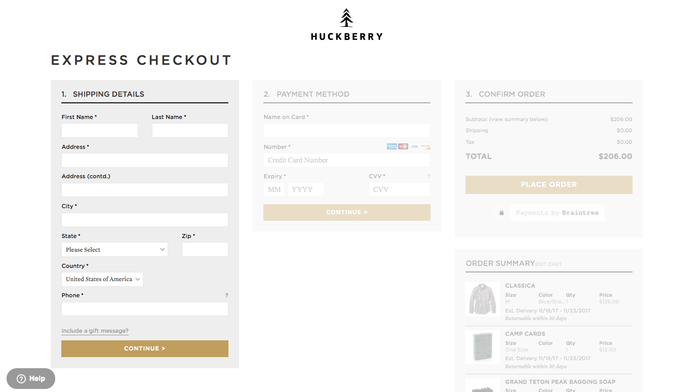 When users sign up to be a Huckberry member, it puts them further down the sales funnel than a casual website visitor. Email is also a way to communicate the Huckberry story with their audience on a regular basis. 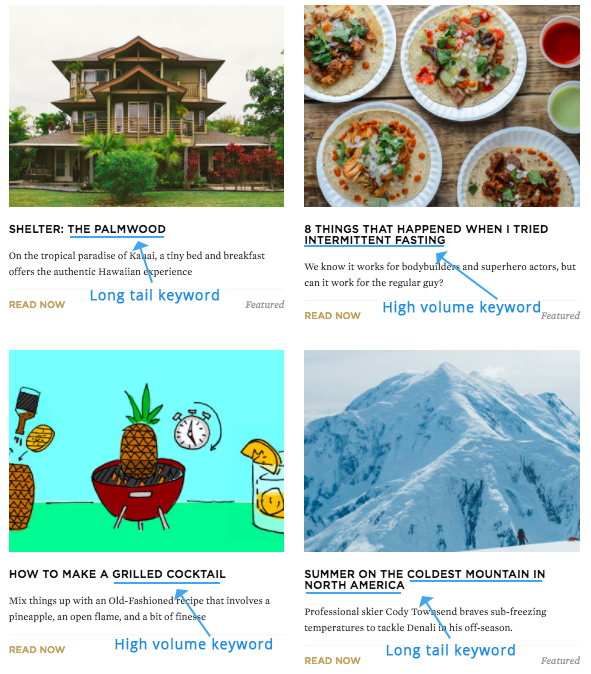 Huckberry’s weekly email edition features stories of people who live and breathe the outdoors, inspirational blog posts, Spotify ‘Song of the Day,’ and a section called “Diversions” that links to interesting stories elsewhere on the web. I can say from experience, their emails are fantastic. They are just plain interesting to read. You know it’s from a company that exists to sell stuff. But you still want to read it because it’s good. That’s the level of copywriting and storytelling you want to achieve in your business. Micah and his team perform a cohort analysis on various segments of customers — where they are coming from, what pages they are visiting, and when they’re either purchasing or churning. With that data, his team then creates custom communication campaigns based on what part of the customer journey each cohort is in. 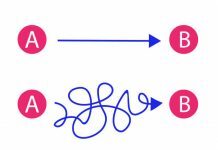 One major challenge for eCommerce brands is when customers abandon their cart — leaving on the final stage of the journey before purchase. “Our approach is this: We use content, specifically email and blog content, to keep people around even if they’ve never bought from us or are never going to buy from us. Chances are, those people will mention our newsletter to their friends. Or, they’ll recommend a product to a family member as a birthday or holiday gift. That focus on long-term customers is why I think we’ve been so successful over the years. 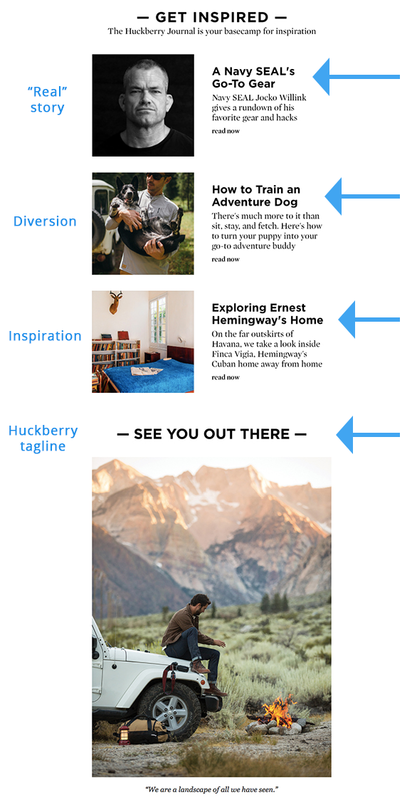 Huckberry has implemented a ton of amazing grassroots programs with the goal of increasing word-of-mouth. Each unique story is authentic and relatable to their target audience. It also provides Huckberry with endless social media and email content that people can easily share to their timeline or forward to a friend. Growth starts with a story. 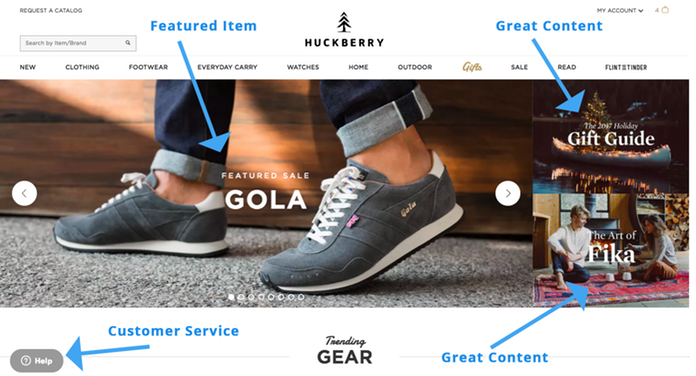 Without a compelling story, Huckberry might just be another brand in the sea of retailers. But it’s their story that keeps people coming back for more. 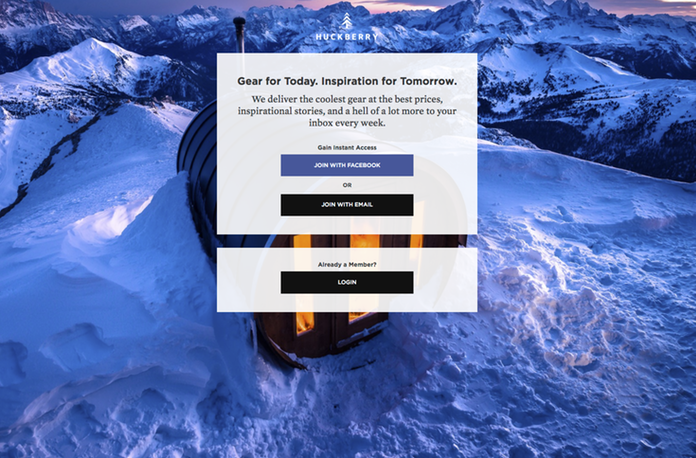 It’s what entices people to open their emails each week, to get outdoors in Huckberry gear, and most of all, to tell their friends about an amazing new business that they’ve discovered. Now it’s time to write your own story. With real talk.